Danish Army Specific: A total of 12 vehicles were acquired in the late 1970´s. Historical: Member of the M39-series 5 ton 6 x 6 truck and produced to Ordnance design from the early 1950´s to the late 1970´s. 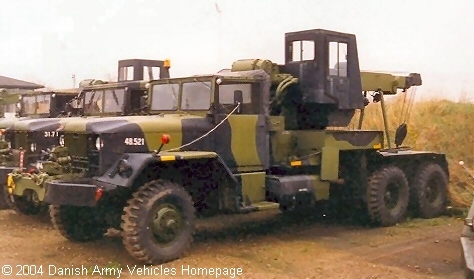 This particular wrecker was based on a reinforced M63C LWB chassis, and designed as both a recovery vehicle and for towing semi-trailers. Produced by International, and mounted with Austin Western hydraulic powered 10 ton telescopic-boom crane. Length: 8.95 m (349 inches). Width: 2.48 m (96 inches). Height: 3.35 m (130 inches). Weight: 20.865 kg (45.903 lb.). Engine: 6-cylinder (Continental R6602), 9.866 cm3 (602 cubic inches) displacement, liquid cooled. Horsepower: 196 at 2.800 rpm. without preparation: 1.98 m (78 inches). Fuel capacity: 355 liter (78 gallons). Range: 369 km (230 miles). Additional: 10 ton front winch.